We gathered pine needles for a forest scented moisturizer, rosemary for a gently scented one, and our beloved nettles and chickweed come together in for a lovely lip balm. The fresh herbs were finely chopped and macerated in olive oil for long hours over the wood cook stove during the cold weekend, then blended with coconut oil and beeswax from a local beekeeper. But what's so special about these blends? 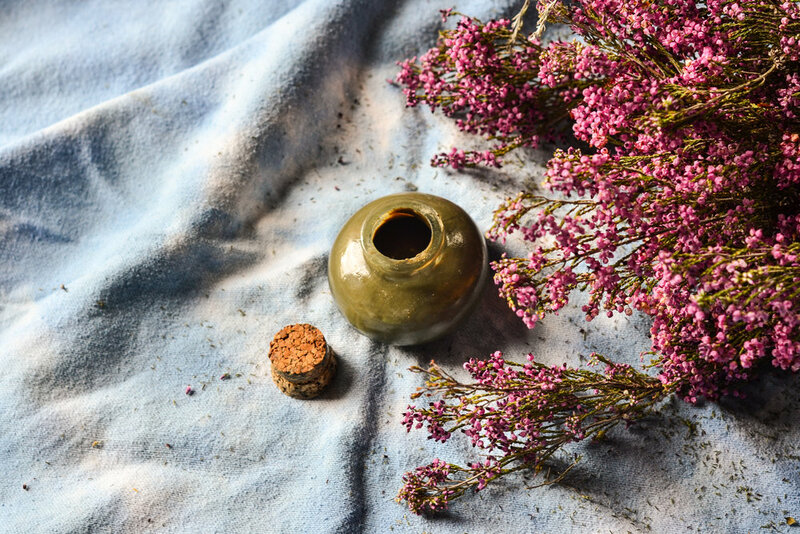 I truly believe the balms are not only infused with the plants themselves, but also with the powerful energy of our environment and our loving hands. Because the herbs were wildcrafted and garden-grown, they carry so much of us within. That's the forest we walk in everyday and the garden where we spend many hours, inside each one of those jars... They are unique. I've listed them on the shop - and worked on its user-friendliness. Making a purchase is easier now, I think, but let me know your opinion on it! Oh wait, it's BUY NOTHING DAY today! Tomorrow maybe? 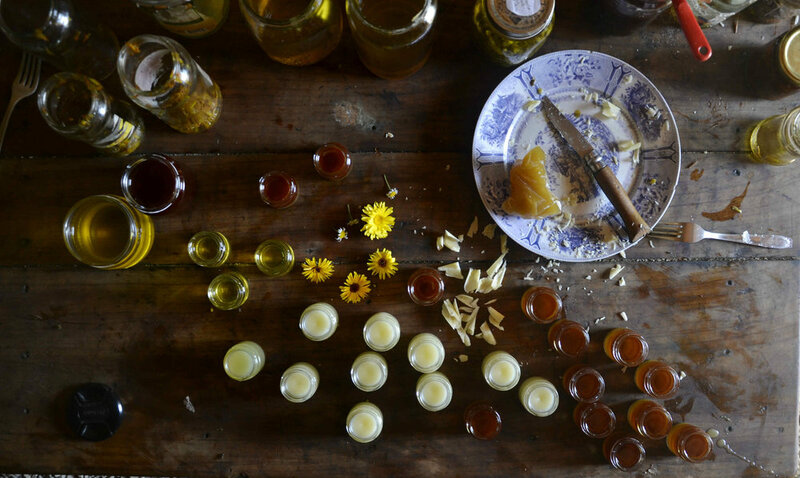 Harvested during full moon and macerated for weeks by the windowsill, these flowers turn into lovely plant medicine for our family.This year we made our biggest batch of salves, from matricaria maritima, calendula officinalis and hypericum perforatum. We actually made so much this year that the process could also be called getting ready for festival season - if you know what we mean. Oh the joys of clarifying beeswax from the neighbour's hives... Not. Big, giant, exquisite mess! "Now where's that leftover block I bought in a store a couple years back?" Big jars, small jars, and some bug bite salves too. We have enough for the whole year, plus to gift to family & friends. And, hopefully, to pay a few groceries too. Which salves are you making this season? Some time ago a tiny talk arose on our instagram about how to make your own body care products. And as promised, here’s a super simple and quick toothpaste recipe, the one I’ve been using over the last couple years.The thing I love the most about doing my own products is, needless to say, how I can create something that really fits my needs. This way, you just remove or add any ingredient your body is asking for. Stir it well, and you got it! You may want to add more or less glycerin according to the consistence you’re looking for. I like mine a bit thick. Also, remember not to add any water to it – you don’t want your toothpaste to mould! Do you want to know a funny story? - For how long haven’t you brushed your teeth?! - Um since this morning… – then I got it – Oh goodness me, it’s the toothpaste that’s dark, I swear! So, just saying, maybe refrain from using it on a first date. We had some busy weeks lately, with many friends staying with us - it is lovely and brings us so much joy! And then, being back to the two of us is like finding eachother again and having a deep breath.This time we used these days to make our annual batch of jeropiga. Jeropiga is a traditional alcoholic drink made from freshly pressed grape juice and aguardente - much sweeter and also much stronger than wine. It's made in different ways according to the region. We make ours the way the old people in the village do. It's very fascinating the fact everything in this is about grapes. The aguardente is made by distillating the rest of the grapes that were used for the wine (so the one we used was made a year ago). It's such an amazing fruit, and through generations people have learnt to take the most advantage out of it. So, three parts of grape juice and one of aguardente equals heaven! We tried to do it a bit better than last year. Harvesting was as fast as a couple hours, since we only picked the grapes from the Tapada da Ribeira. We knew from the beggining we didn't have that much aguardente, so better to keep it simple. Last year we made around 20 litres (ah, amateurs! ), this year was around 60 (getting better). This time we separated the white from the red grapes, in order to have two different jeropigas. And a few more buckets. We then filtered it twice and let it rest for one day. It's beautiful to see the different colours. After filling all the small bottles we stored the rest in 5 l bottles. They look really nice. We were super proud! And then... Mistake: we didn't let it rest enough after adding the aguardente. The result is that layer of deposit you see, specially in the red ones. Then we considered emptying the bottles into a bucket and letting it rest for a couple days. Actually we went a bit farther than just considering it, but as soon as we emptied two of the thinner ones we realized we couldn't re-capsulate them after! Ahah :D That's ok.
Two days ago we picked a bag full of apples, and there are still so many on the tree. And then we cooked them slowly, to make delicious preserves. As I write these words, there's a pot of apple jelly cooking on the stove. We make it with all the skins and seeds of the apples - the women in the village teached us the recipe, so nothing goes to waste. After cooked and drained, they turn into chicken food. It's a cycle!